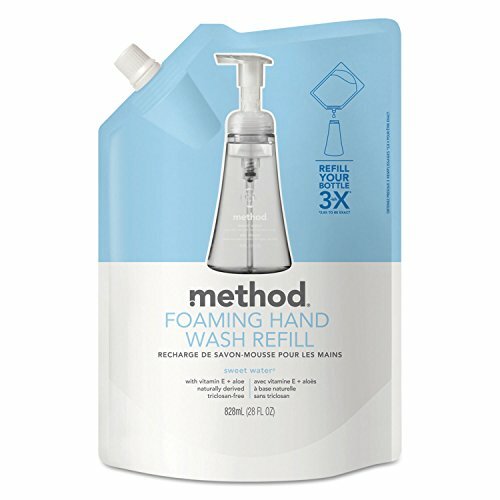 This biodegradable foaming hand wash refill will fill your foaming hand wash pump almost three times. The convenient, smart-pour spout container takes up less storage in your cabinet and has at least an 80% less environmental footprint than a PET bottle. Free of dirty ingredients like parabens, phthalates, triclosan and EDTA yet works as effectively as chemical soaps and hand washes. Never tested on animals. Biodegrades in less than 28 days. Naturally derived foaming hand wash leaves hands feeling clean and soft. Convenient, smart-pour spout container takes up less storage in your cabinet. Contains almost three refills for the 10 oz. pump. Formula biodegrades in less than 28 days and is free of dirty ingredients like parabens, phthalates, triclosan, EDTA or animal by-products. Has at least 80% less environmental footprint than a PET bottle.